A legendary bop pianist with fluid and elegant streak, Duke Jordan may be best known for being pianist with Charlie Parker's classic 1947 quintet but he had a long and fruitful career. After his year with Parker (his piano introductions to such songs as "Embraceable You" were classic), Jordan worked with the Sonny Stitt/Gene Ammons quintet (1950-1951) and Stan Getz (1949 and 1952-1953). 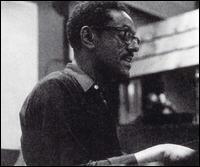 He started recording as a leader in 1954, debuting his most famous composition, "Jor-Du," the following year. Although he worked steadily during the next few decades (writing part of the soundtrack for the French film Les Liaisons Dangereuses), Jordan was in obscurity until he began recording on a regular basis for Steeplechase in 1973. Duke Jordan, who was married for a time to the talented jazz singer Sheila Jordan, lived in Denmark from 1978 until his death on August 15, 2006. He developed a special friendship with Mitsuo Johfu, the owner of a Japanese independent label Marshmallow Records. Fortunately for all of us, some of his last performances can be heard on Marshmallow CDs.